According to the Bureau of Labor Statistics, the job outlook for fitness trainers and aerobic instructors looks positive through at least 2018, with growth rates estimated at 29.41 percent. Given the current epidemic of obesity and the continued national focus on health and fitness, it makes sense that these jobs would continue to grow. One of the benefits of entering this job field is that extensive post-secondary education is not required, making it relatively easy to enter the field. There is more to being a fitness expert than simply passing a certification exam, however. Discover what most fitness and aerobic jobs entail. In most cases, receiving a certification is a fairly straightforward process. Almost all certifying bodies require that you be at least 18 with a high school diploma and proof of a current CPR certification. If you have all those things in hand, you just have to prepare for and pass the exam. Some aerobic instructor certifications require that you have a certain amount of experience taking aerobics classes before sitting for an exam. Even if the certification doesn't have this requirement, it's definitely a good idea to take classes and make sure you enjoy them before investing time and money into a certification. It should go without saying, but to be successful as a fitness trainer or aerobics instructor, you need to actually enjoy exercising and promoting a fit lifestyle. If you don't have a degree in exercise and sport science or a related field, you'll definitely want to purchase study materials or sign up for a course to help you prepare for the exam. These certifications aren't easy, so you need to be prepared. Even if you do have a degree in a related field, it's important that you brush up on your knowledge before you sit for the test. If the certifying body offers practice exams, go ahead and take one. This will help you identify areas of weakness and help familiarize you with the test-taking process. Not everyone is qualified to sit for every exam. For instance, the National Strength and Conditioning Association's Certified Strength and Conditioning Specialist (CSCS) certification requires that all exam takers have a bachelor's degree, a chiropractic degree or be enrolled as a senior at an accredited college or university. Similarly, the American College of Sports Medicine's Certified Health Fitness Specialist certification requires a bachelor's degree within exercise science or kinesiology, while their Registered Clinical Exercise Physiologist certification requires a master's degree in the field and 600 hours of clinical experience. 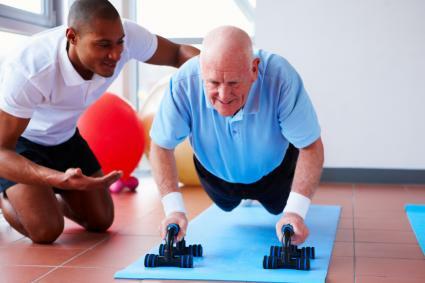 These certifications go above and beyond the basic fitness trainer requirements, preparing you to work with athletes or individuals with special medical issues. This means you may have more opportunities at colleges, universities, hospitals and therapy settings than most traditional trainers. There are also specialty certifications that you can obtain above and beyond your basic credential, particularly within the aerobics field. Because some aerobics classes have a very specialized format, they require additional certification. Zumba, yoga and Pilates are just a few of the aerobics classes that will require special training. Luckily, if you already have an aerobics certification and experience taking the classes you're interested in teaching, the process of certification is fairly simple. It generally requires seminar attendance and a subsequent exam. The goal for most fitness and aerobics instructors is to teach clients and class members how to safely perform exercises in an enjoyable format. While leading and instructing is a primary focus of these positions, there's often more to the job. Fitness trainers work closely with clients in one-on-one or small group formats. Trainers are expected to meet with their clients to determine their goals, then set up programs to help their clients achieve success. A large focus is on program design and exercise instruction to ensure that clients perform each exercise safely and effectively. In addition to trainer-client interaction, most trainers are expected to sell training packages in order to make commission and help support the fitness facility. Some facilities have trainers work on 100 percent commission, so if you're uncomfortable with this pay structure, make sure you know what the gym or fitness facility offers before accepting a position. You may also be required to help clean equipment, answer phones and monitor the fitness desk to answer member questions. Aerobic instructors teach a variety of fitness classes usually to members of fitness or recreation centers. Most aerobic instructor positions are part-time because teaching classes is hard work. In addition to leading and instructing, you're actually performing the exercises yourself to demonstrate proper form, so teaching more than two classes a day can be downright exhausting. Aerobic instructors are usually paid by the class or the hour, and they may also receive bonuses based on class attendance. A large part of the job is building a rapport with members and encouraging them to come back. In most cases, you'll also be asked to make sure all the equipment you need is available before class, wiped down after class and put away in an organized manner. Depending on the facility, you may be asked to provide your own workout music and to manage the sound system before, during and after your class.